Elegant diamond print on gray felt! Gone are the days when gray is a dull and boring color. 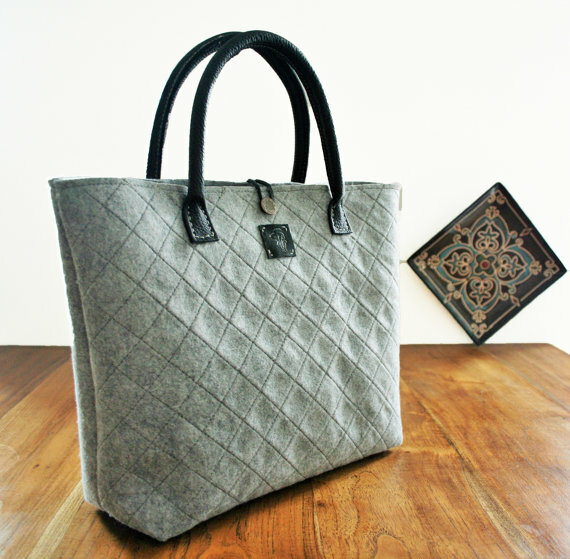 This tote handbag is the perfect example of how gray can be warm and very fashionable. In a smooth felt with leather accents, this bag is an ideal everyday bag for ladies with a fast-paced life, and for girls with great style. Love this bag for winter! Felt is not the expected textile for a tote or handbag, especially not as the outside fabric, but this purse pulls it off! 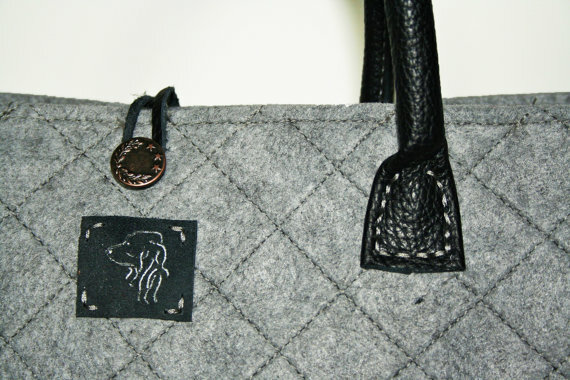 The entire outside of the bag is constructed out of a 3mm wide Italian felt in a sharp gray color. Gray is one of the best colors for matching! The black accents allow you to easily pair this with black shoes or a black sweater, but if you are wearing a cream blouse or brown boots, the gray will also compliment nicely. 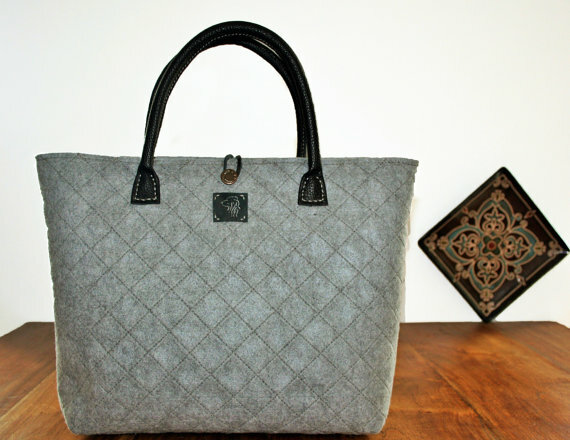 The felt also has a diamond pattern across the entire front of the bag. It is a symmetrical stitched pattern that adds some serious style and elegance even though this is bag that is more on the casual side. Genuine leather handles with a short drop length for the crook of your arm! This handbag can both double as a purse or a tote bag because of the handles. It has two short-ish handles in a thick genuine leather. The handles are sewn neatly to the outside of each side of the bag, and two handles allows way more versatility than just a single strap. Each handle drops just 5.5 inches so this is a bag that would look really swank in the crook of your arm, or can be carried like a tote in your hand. Two convenient pockets inside, with lots of space! The inside of this bag is lined by the underside of the felt. It is a smooth fabric all the way through. The purse is stitched together on the sides and the bottom for durability. There are also two convenient pockets sewn into the inside of the bag. 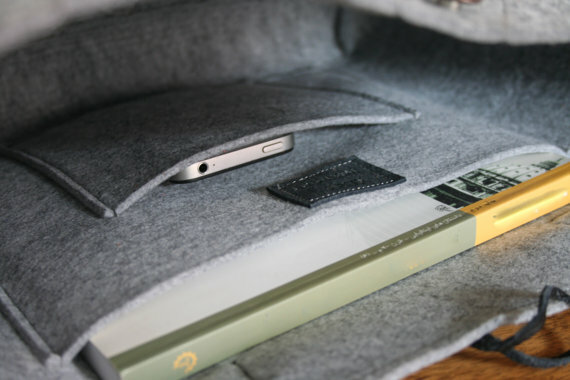 There is a large packet that would fit an iPad or a book, and there is a smaller slip pocket that would be a perfect fit for your phone. This accessibility is absolutely necessary for ladies on the go! The top of this bag also features a button on the outside of the bag to secure a loop on the alternate side. That way your things are safe in the bag but easy to get to. If you’re looking for a different kind of handbag to still serve all your functions this gray felt purse would be a great accessory. Straying away from normal leather bags, the felt is warm and adds a polished flash. A perfect bag for this coming winter, especially if you need more room to hide holiday goodies since it is 15 inches by 10 inches and is 3 inches deep! You can find other felt bags with leather accents at AlmaHandmadeInMilan.